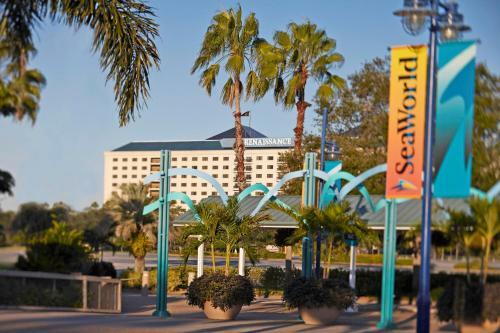 With a stay at Renaissance Orlando at SeaWorld in Orlando, you'll be in the entertainment district, within a 15-minute walk of SeaWorld® Orlando and Aquatica. This 4-star resort is 1 mi (1.6 km) from Discovery Cove and 2.1 mi (3.4 km) from Pointe Orlando. Make yourself at home in one of the 781 air-conditioned rooms featuring flat-screen televisions. Your bed comes with premium bedding, and all rooms are furnished with sofa beds. Wireless Internet access (surcharge) keeps you connected, and satellite programming is available for your entertainment. Private bathrooms with shower/tub combinations feature complimentary toiletries and hair dryers. Pamper yourself with a visit to the spa, which offers massages and facials. If you're looking for recreational opportunities, you'll find a complimentary water park, an outdoor pool, and a spa tub. Additional features at this resort include complimentary wireless Internet access, concierge services, and an arcade/game room. Enjoy American cuisine at Tradewinds Restaurant, one of the resort's 5 restaurants, or stay in and take advantage of the room service (during limited hours). Snacks are also available at the coffee shop/café. Relax with your favorite drink at the bar/lounge or the poolside bar. Buffet breakfasts are available daily from 7 AM to 11 AM for a fee. Featured amenities include a business center, limo/town car service, and express check-out. Self parking (subject to charges) is available onsite.